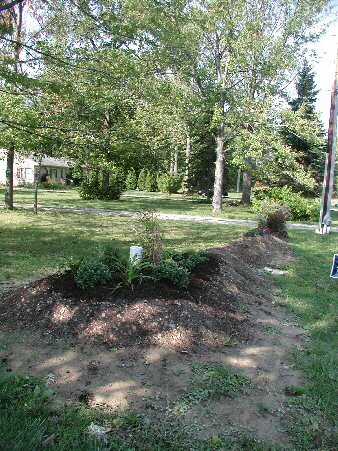 The soil in our area is all clay, so what we then did was rototill the mound of dirt whenever we could all summer long and spread it out so that it is about 6 inches higher than the rest of the yard. This will allow for the soil to settle over the next few years. As it settles, we will take the soil from the sides of the mound and move it into the areas of settlement. Along the road we used to have a line of Blue Spruce trees that were planted by the former owners of the property more than 27 years ago. They apparently didn't think to look up when the planted the trees or they might have noticed the power lines directly overhead. Well, after 25 or so years, the Spruces were growing into the power lines and one in the middle was blown over a couple of years ago. When the power company came along and topped them off to protect the lines, it was clear to us that they would have to go as they were pretty ugly after that. 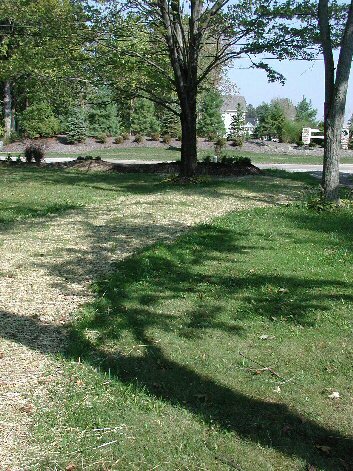 After considering the cost of having the stumps removed, we decided to cut them even with the ground and create an island over them. After Labor Day and before the rain from hurricane Ike arrived we gave the trench area a final grading, spread some 12-12-12 fertilizer and planted grass seed with a straw mulch. The photo below shows the grass coming up after about 10 days. The sewer project left us with some extra dirt which we used to create the island. The island covered the stumps and made an addition to our front yard garden. As we rototilled the trench, we took the soil from the high spots and built the island with it. 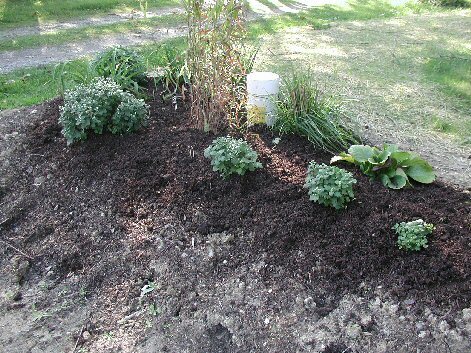 We mixed compost, grass clippings and Sweet Peet with the clay to give it some texture and improve the water retention quality of the soil. We built it high, again because it will settle over the winter and planted it with various ornamental grasses, some daylillies, Japanese Iris and a couple of other perennial plants. as seen in the photo below. The close-up below shows the latest addition- Chrysanthemums ready to bloom. The smaller ones in the foreground were propagated from cuttings taken from last years mums that started growing again this year. Cathy trimmed the plants to make them more bushy and then she took the cuttings, dipped them in rooting hormone and stuck them in potting mix. This is an easy and inexpensive way to have more mums each year. We haven't decided on what the final mix of plants will be in the island and will probably move some of them as our vision of our front yard garden becomes clearer. We will be planting daffodils, grape hyacinths and crocuses around the island in the next couple of weeks, however.